streaker69;153277 Wrote: So you think maybe Officer Tom Hanson has something to do with your defective bulb? Nah, it might have been Sergeant Judith "Judy" Hoffs though. Phillips "slim style" LED 60Watt spotted in the PA wild for $3.97 after PECO subsidy. Cheapest I've seen yet. Those are snazzy, I really like them. Though I have to admit, I have a love/hate thing about night-lights. On one hand, they're great when you have kids. On the other hand, they really make it easy for an intruder to get around our house. Since I'm more concerned about me (or the kids) tripping over something that shouldn't be there, that's the greater risk IMHO. And $10, I'd expect 7 or 8. Don't the knock offs usually come in close to half? For any advantage it would give an intruder it would give you the same advantage with the benefit of decreasing the chance you shoot one of your kids in the dark by mistake or a teenager sneaking back in the house in the middle of the night. I notice a lot of weapon lights they sell these days are so bright they tend to wash out any definition from what you're aiming at especially if you're getting up in the middle of the night and your eyes have already become acclimated to the dark. Those look nice. They're expensive because they are nice - and have no competition. Yet. I like the ones I got at Sam's Club (posted in this thread?) but you lose one outlet with those. That's a big selling point with these ones - that and the simple installation. However, the ones I have are also power outage emergency lighting and they come on when the power fails - these do not. Yeah, the ones that I posted about. I have them in places where you'd really only be using one outlet, for things like a vacuum. 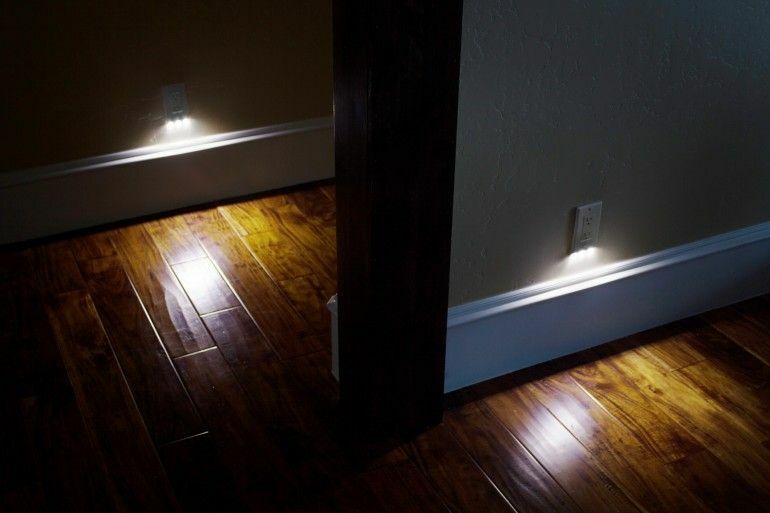 I put them near the exterior doors just to make it a bit easier to find the door in a total blackout. After work I saw Home Depot has the 60 watt slim style bulbs for $1.97 a piece in PA, PECO subsidy again. That is ROCK-BOTTOM I think for now I bought out my local store over the PA line for my friends and family. I bought out all 45 of them at that price. Now is the time to convert the whole house. They are normally 8.97 a pop. Wouldn't it be nice if instead of subsidizing bulbs of out of state-rs like me, they just didn't gouge you guys for energy and just gave you guys a break on your bills and let you buy your own bulbs? Woot (Tool & Garden) has 6 packs of 40 (450 Lumen) and 60 (800 lumen) Watt equivalent bulbs on sale today. 22$ for the 450 lumen and $29 for the 800 lumen. 4.5 review average on Amazon so they must be decent. $5 for shipping for up to 8 packs.